An introduction to the author who is not me. Poaching is a cooking technique that is usually neglected in most cookery books. When meat is thrown into simmering water it inevitably emerges tough and unsatisfying. Think of uncooked chicken in a simmering laksa stock. The toughness is produced because, when the water is at simmering temperature (not to mention boiling), the proteins in the meat begin to harden and disintegrate and the meat becomes dry and tough. Poaching is generally confined to fish and white meats such as chicken and veal. Lately, though, I have been applying poaching techniques to other ‘boiled’ meats such as ox tongue and silverside and the results have been quite sensational. So much so that Dad’s fishing mates have been asking for recipes. A compliment, indeed. You will find various references to poaching throughout the book. There is a recipe for Poached Chicken Breasts in this section and “Buffets and Cold Lunches”. Vitello Tonato is a delicious veal and anchovy dish served with tuna mayonnaise (also in “Buffets and Cold Lunches”), is a classic poached dish, as is Poached Whole Fish in the same section. Poaching is the slow cooking of meat or fish in water or a court boullion (water enhanced with herbs, spices and vegetables). Poached meat tends to lack colour, but is tender, moist (if properly done) and full of flavour. It has the advantage of being low fat and also of producing some wonderful stocks that can be re-used for poaching, added to soups or used as a base for risotto. A heat diffusing mat is essential for successful poaching. I find that even the lowest heat on the smallest gas ring will eventually bring a stockpot full of liquid to simmering point without one. A drop lid is also useful. A drop lid is a wooden lid slightly smaller then the diameter of your stockpot that sits on top of the meat and keeps it fully submerged during cooking, allowing all the meat to be cooked evenly. I discovered drop lids when doing my Japanese cooking course. Mine is simply a round wooden breadboard with a knob attached to the centre for lifting it in and out. It should always be soaked in water before using. 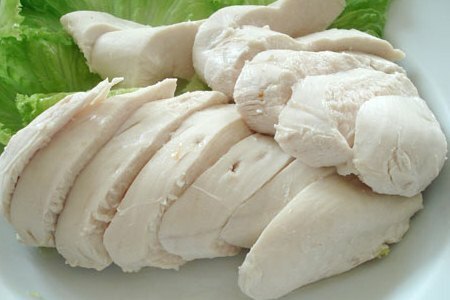 The method of poaching small items such as chicken breasts and fish fillets is slightly different from the method of poaching large ones, though in both cases the cooking is done at poaching temperature. Poaching temperature is a point, well below boiling point, when the surface of the liquid shivers, but no bubbles appear. In a clear liquid you will be able to see a few tiny bubbles on the bottom of the pot, but they will not rise. Never let the liquid simmer, let alone boil. To poach small pieces of meat or fish fillets, bring the court bouillon (water, stock or other liquid with flavourings added) to simmering point. There should be enough liquid to just cover the meat or fish to be poached. Place meat in the simmering liquid; the temperature will immediately drop to poaching temperature. Watch carefully that the liquid does not return to a simmer and continue to cook until the meat is tender. Remove the pan from the heat when cooked. If the meat is to be served cold, it should be allowed to cool in the poaching liquid. If it is to be served hot, it should be left in the poaching liquid to rest before serving. Some of the larger cuts of meat will form a scum on top of the liquid when the liquid boils. For this reason, the meat is placed in cold water without any aromatics and brought to the boil to release any scum. The water is then tipped out and the meat is ready to poach as follows. To poach larger items, such as the veal in Vitello Tonata, whole fish, corned silverside and ox tongue, the meat is placed in enough cold court bouillon to just cover it and is then slowly brought to poaching temperature. This enables the heat to slowly penetrate to the inside of the meat without overcooking the outside. The temperature is kept at poaching point for the entire cooking period. Again, whether the meat is left to cool completely in the poaching liquid generally depends on whether it is to be eaten hot or cold.